The Free Press is the official student newspaper of the University of Southern Maine. 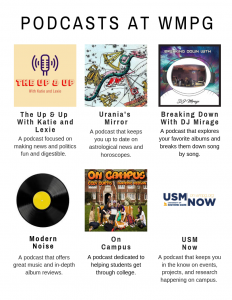 The papers mission is to be the definitive source of news and commentary for the USM community. In September 2016, the Free Press started recording audio commentaries titled Press Perspectives that air on WMPG on Tuesdays at 7am, 8am and 4pm. The weekly features are spearheaded by editor-in-chief Krysteana Scribner.